7,380-acre Corps of Engineers reservoir with a 60-mile shoreline. Parks at lakeside offer campsites, picnic areas, boat ramps, marina service, swimming, and fishing supplies. Home of the Dallas Water Ski Club; many ski shows and competitions staged throughout the spring and summer. Boat Docks: Are they permitted? No, some were grandfathered in. Building restrictions: Corp property - no property directly on lake. Property owners abutting the lake are NOT allowed to build a boat dock. Large mouth bass are the most popular sport fish in the reservoir. The slot length limit is designed to encourage harvest of the smaller bass. Small mouth bass were stocked into the lake in 1999 and should provide angling opportunities in several years. White bass, white crappie and channel catfish are also popular with anglers. FISHING COVER/STRUCTURE The Twin Coves area has a large amount of flooded timber. Numerous areas of the lake have shoreline with large boulders. Boat houses in McPherson Slough attract fish. 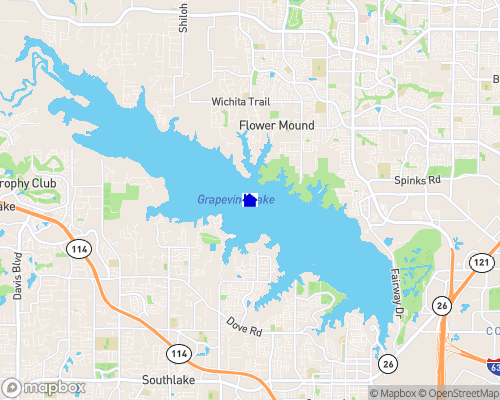 FISHING TIPS AND TACTICS Grapevine Lake has many drop offs and underwater structure changes that hold large mouth bass. Rocky shorelines and boathouses are also good spots for large mouth bass. The water intake near the dam has a air injection area that attracts white bass. Twin Coves and the rocky shoreline around this area are good for catfish and crappie. FISHING REGULATIONS Statewide regulations apply to most sport fishes in Grapevine Lake. The exception is a 14- to 18-inch slot limit for large mouth bass. This length limit is designed to improve the growth of the bass and improve the quality of angler catch. The USACE operates major parks on Grapevine Lake. Most of these parks provide campgrounds, beaches, picnic areas, and opportunities for shoreline fishing. Good boat ramps exist at Oak Grove Park, Murrell Park, Twin Coves RV Park, Silver Lake RV Park, Meadowmere Park, and Marshall Creek Park. An entrance/boat ramp fee is charged at these parks. Contact the Lake Grapevine office at 817-865-2600 for more details on park usage.